Location/ Directions: From U.S. Interstate Highway I-35, take the University Parks Drive exit 335 B West. The hotel is located at the intersection of University Parks Drive and Franklin Avenue. About Hotel: 11-Floors, 195-Rooms, Interior Corridors, Non-Smoking Hotel, Pets allowed, Business Center, Cribs, High chairs, Playpen, Elevators, Gift Shop, Laundry, Lounge, News Stand, Room Service, Fitness Room, Pool, Air Conditioning, Alarm Radio, Black-Out Curtains, Ergonomic Desk Chair, LCD 32" Flat Panel Cable TV, Thermostat (adjustable), Work Desk with Adjustable Lamp, 24 Hour Housekeeping, Coffee Maker, Hairdryer, Free High Speed Internet, Iron/Ironing Board, Newspaper M-F (USA Today), Rollaways, Two telephones with Voice Mail. Railroad View: Good Distant View from high floor rooms on the east side of the building. Photo Comment: The distant view can be seen here between the railroad and the hotel. High floor rooms on will also get you a view of the river. Location/ Directions: If you are driving south on Interstate 35, exit University Parks Ave. Turn right (west) onto University Parks Ave. The second city street will be Clay Ave. Turn left and you will find Hotel Indigo Waco-Baylor one block on the right. If you are driving north on Interstate 35, exit University Parks Ave. Turn left (west) onto University Parks Ave. The second city street will be Clay Ave. Turn left and you will find Hotel Indigo Waco-Baylor one block on the right. About Hotel: 4-Floors, 111-Rooms, Interior Corridors, Business Center, Fitness Center (On-site), Standard Internet service is free for all guests, Outdoor Pool, Daily Housekeeping, Lounge, Ice Machine, Restaurant, Color Cable / Satellite TV, Work Desk w/ Lamp, Speakerphone with Voice Mail, Hairdryer, Private Bathroom, Coffee Maker, Microwave Oven, Mini Refrigerator, Tea Maker, Double Glazed Windows, Individually Controlled Air Conditioning, Iron / Ironing Board, Rollaway Bed/Cot, Windows Open by Guest, All rooms non smoking, Pets Allowed (fee). Railroad View: Excellent View from high floor rooms on the rear of the building. 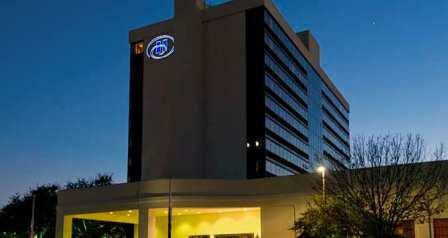 Notes: While in town, visit the Dr. Pepper Museum, a few blocks away from this hotel. Its within walking distance. 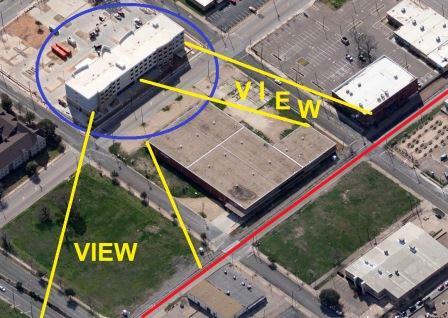 Photo Comment: In the aerial picture, the building along the tracks will foul some of the railroad view from the hotel. The north side is wide open for an excellent view of the hotel. The railroad is marked in red. Hotel is circled with blue. This view looks southeastward. Location/ Directions: Interstate 35 S. Exit Univ Parks Dr, right at light. We are on left. About Hotel: 3-Floors, 78-Rooms, Interior Corridors, Free high speed Internet, Free breakfast, Pet friendly, Fitness center, Business center, Pool, Kitchen/kitchenette, Complimentary on-site parking, Bar-B-Q and/or picnic area, Coffee/tea in-room, Grocery shopping service, Housekeeping service daily, Laundry on-site (coin operated). 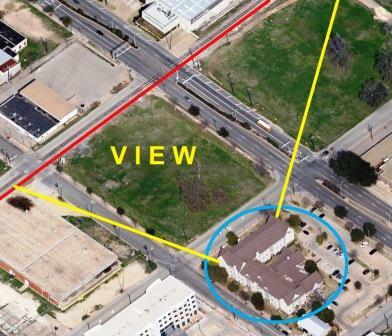 Photo Comment: The aerial photo shows the Residence Inn circled in blue, the railroad marked with red. There is a wide view of the railroad from the hotel.